As someone who writes about food, I’m always thrilled to hear of a cookbook author opening a restaurant. I find the idea that a writer who has invested time and sweat in mastering a cuisine has the guts to apply some of that knowledge and passion to a restaurant setting hugely inspiring. 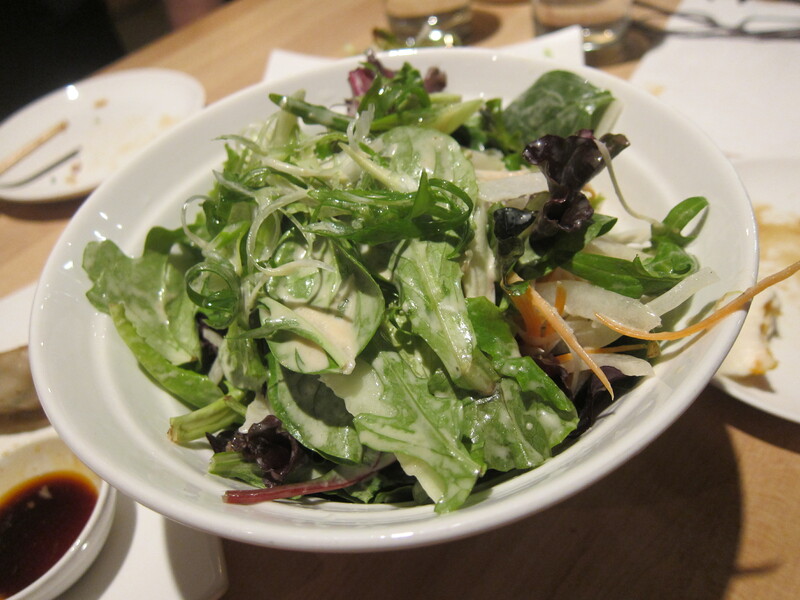 And so when I heard that Harris Salat, the fabulous author of several terrific Japanese cookbooks, had opened a little ramen shop in Brooklyn in September, I knew I had to stop in. Once you step in though, you’ll know you’ve come to the right place. Call or email for a reservation if you can, because even the shortest wait will prove unbearable. Watching bowls of simmering broth and noodles and crispy gyoza and spring rolls passing you will drive you nuts. Harris has partnered with a true Japanese pro — Rio Irie, who was second in command at the well-regarded Matsuri for some years. (You can spy Rio cooking through the glass-walled kitchen, in fact.) And the menu they’ve crafted together is a greatest hits medley of Japanese comfort food. 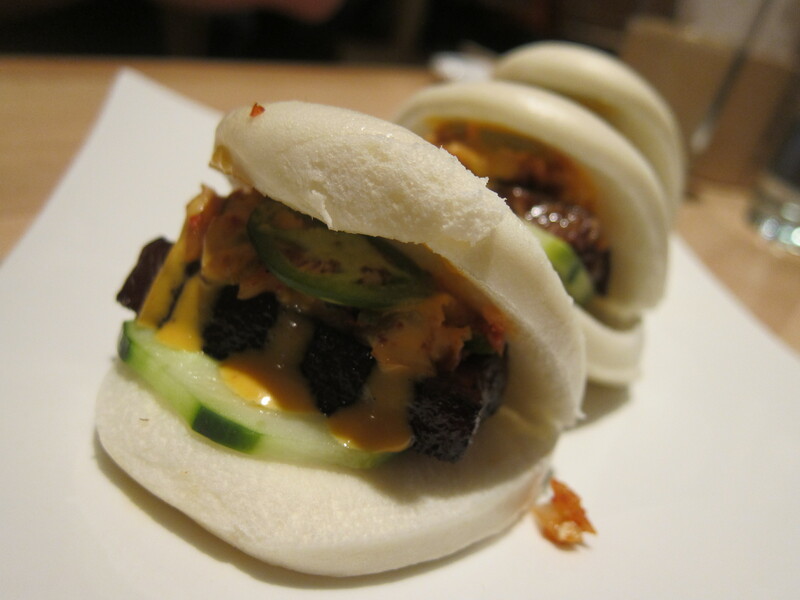 To start, the braised pork belly buns with jalapeno kim chi and spicy mayo ($9 for 2) seemed a must. I’ve had pork belly and kim chi buns before — and my own mother makes one hell of a braised pork belly sandwich. So as you might imagine, I’m a little fussy about these buns. These, however, were outstanding. The pork was fall-apart tender and the various spicy fixings were a lovely foil and in just the right amount. I liked the added crunch (and cooling factor) the cucumber added as well. The next few dishes made our heads spin, however. 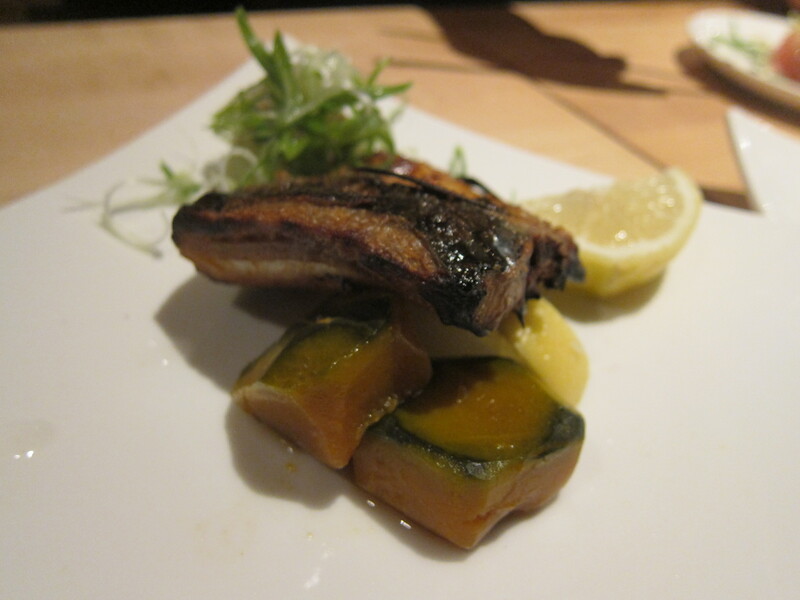 The shio saba ($12), grilled salt-cured mackerel came with a super fishy smell that intrigued us. Once we bit into the soft, sweet fish with the salty, slightly crisp skin, though, we didn’t think any more of it. The crispy Nanban chicken ($9) had piqued our interest — Harris explained to us that “nanban” means barbarian in Japanese and this dish is considered a “nanban” dish because the sauce is made with vinegar, an ingredient that Portuguese introduced to Japanese cooking. Since all foreigners are barbarians, nanban this was. This boneless chicken leg had been grilled brick-style, which tends to bring about deliciously juicy and tender meat with a nice char, and this certainly was the case here. Topped with a mound of scallions and a vinegary soy sauce, the chicken bites were seriously addictive. 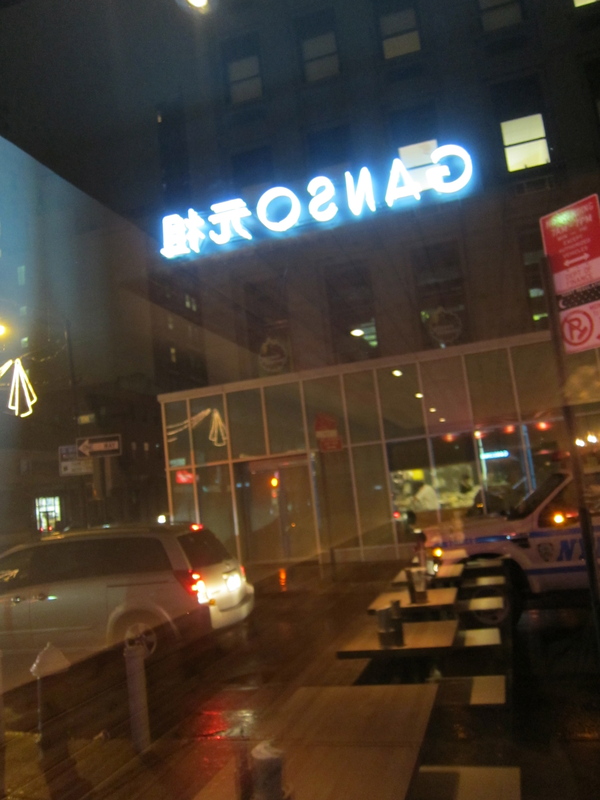 The gyoza, however, was what blew my mind. 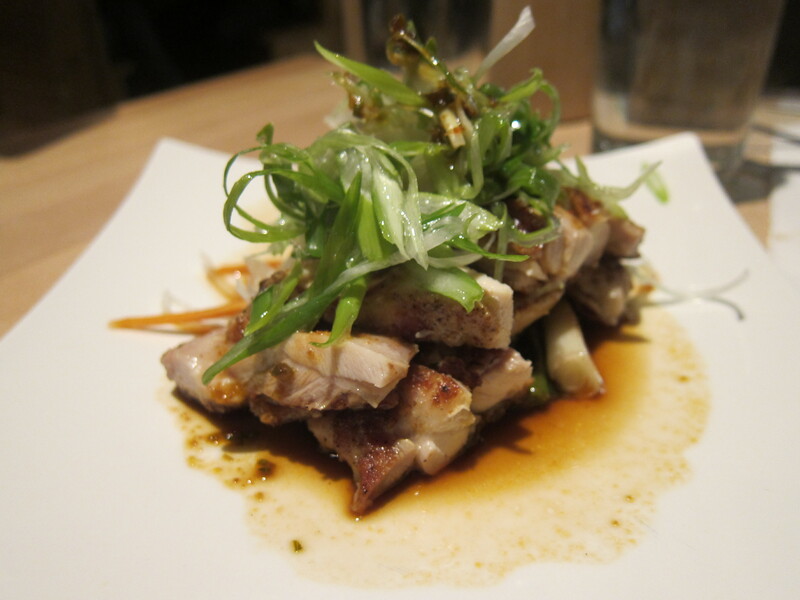 Beyond the hane, the pork and garlic chive filling was fantastic — incredibly juicy and packed with umami. 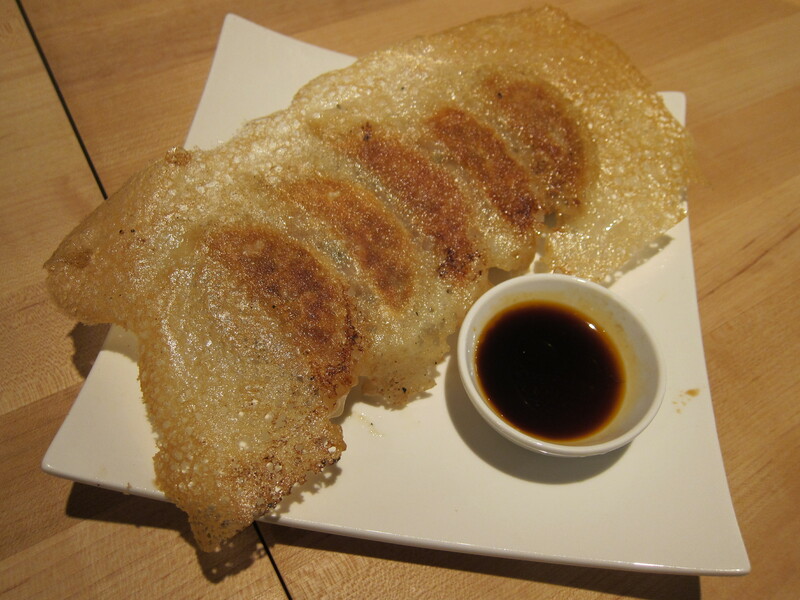 Even though the gyoza came with a chile-soy dipping sauce, I actually didn’t think it needed it. These are terrific all on their own. We were having such a feast that I’d almost forgotten the main point of the meal: Ramen. The Ganso ($12) came with slow-braised pork shoulder and pork belly and ajitama (soft-boiled) egg swimming in a classic soy broth. Though this was Ganso’s standard bowl of ramen, it was anything but basic. 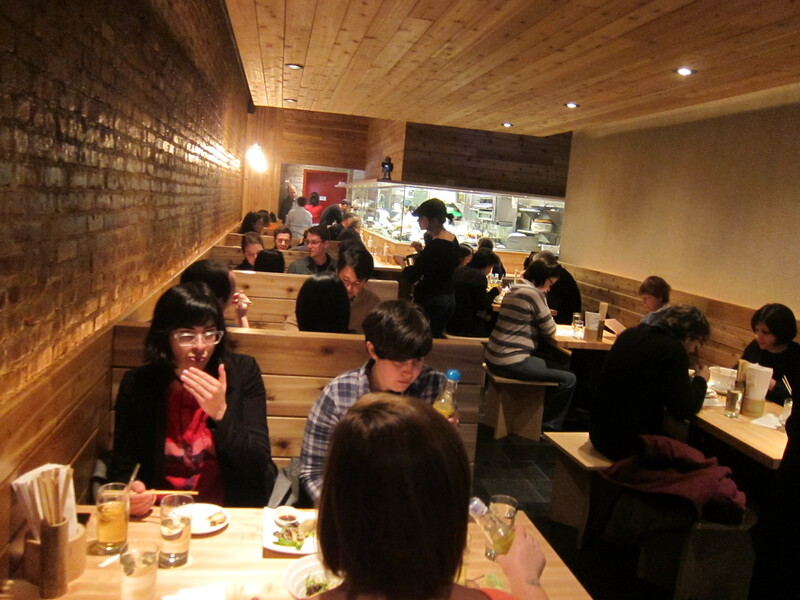 The noodles here — as with all our bowls — were perfectly al dente and delicious. 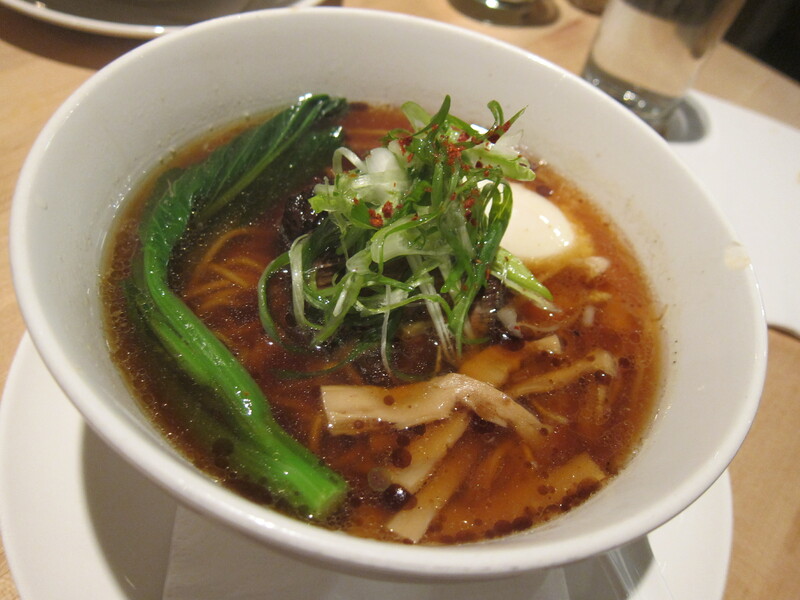 The short rib ramen ($15) featuring a soy-beef broth, slow-braised short rib and onsen (slow-cooked) egg was unusual given that you’ll more likely see pork or chicken noodles in many New York City ramen shops. After tasting this broth and beef though, I wondered why this wasn’t already one of the standards. It seriously should be. The piece de resistance for me: “Stamina” noodles ($14), a heady combination of roast chicken slices, napa cabbage, garlic chives and gobs of spring onions in a chili-soy sauce-chicken broth hopped up on shrimp paste. Spicy noodle soups have a very special place in my heart and this Stamina ramen (a hearty concoction designed to give you stamina, apparently) is now up there on my list. The taste, though slightly fiery, was not immediately searing like some Korean or Southeast Asian noodle soups can be. Instead, it was more elegantly layered and complex — definitely spicy but slowly coating your senses, gradually building to a comfortable crescendo. 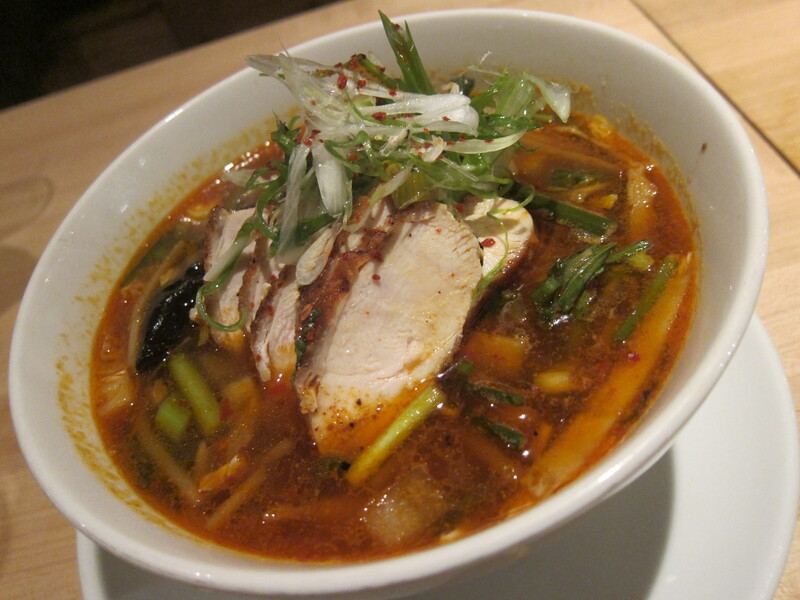 As much as we loved the individual ingredients in each bowl, the broths were what captivated us. 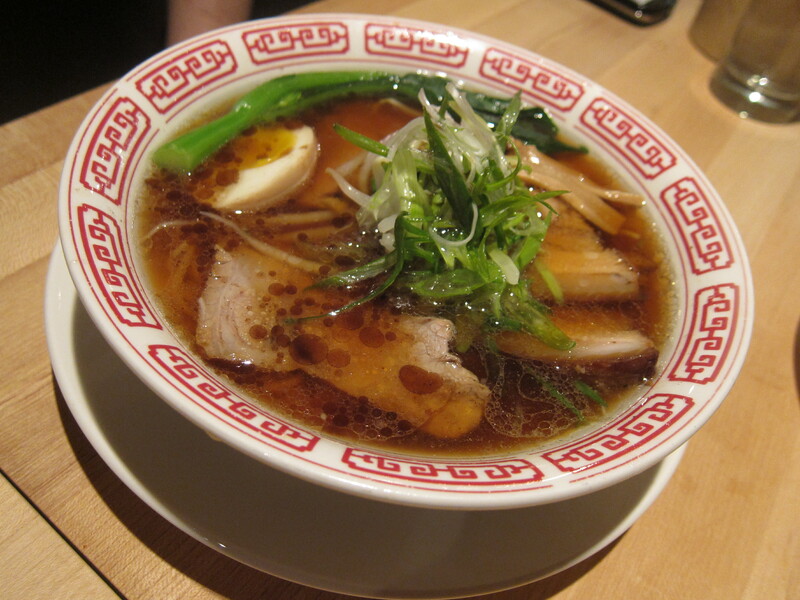 I have an issue with some of the most popular ramen joints in New York — broths can be so rich they’re unsettling to the stomach or so pumped up with MSG that I find my heart racing long after the meal. Ganso’s, however, is perfection — just the right amount of rich (and just slightly oily) and just filled with pure flavor from long simmering with bones. By the bittersweet end of our meal, mere drops remained in each bowl. And instantly, we vowed to be back for more.